New for 2019, Piaggio Group Americas is glad to announce the arrival of the new V7 III Racer Limited Edition dedicated to USA and Canada only. The new Moto Guzzi V7 III Racer Limited Edition is not only the sportiest of the range , but also the one with the most prestigious parts. 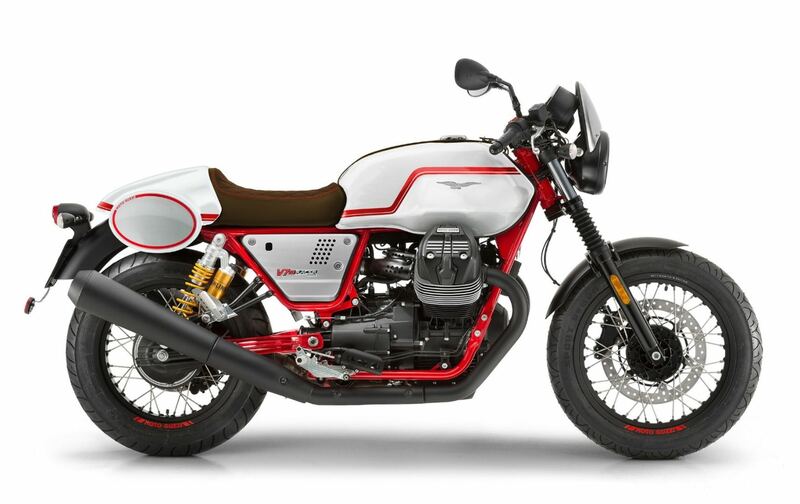 This backs Moto Guzzi’s ability to continuously create true customs directly from the factory. The V7 III Racer Limited Edition’s sporty nature is emphasized by its semi-handlebars and its splendid, humped seat . In accordance with tradition, the Racer has a single-seater sport bike look, but in reality, this new version is approved for two-up riding. In fact, it has passenger foot pegs and, as before, the seat cover can be easily removed when necessary. The spoked wheels have black channels and red Moto Guzzi stickers like the other sport models from the brand. Otherpremium components that stand out are theset-back foot pegs, which aremachined from solid billets, the lightened steering stem and the steering yoke guard. The most important technical innovation is the V7 III Racer Limited Edition’s Öhlins shock absorbers, adjustable in spring preload and in rebound and compression . The top name in suspension, the Öhlins suspension ensures top performance while throttling some backroads.